With the use of a Popdock widget you can integrate a Popdock list or multiple lists directly into your Salesforce user interface either as a tab at the top or as a button that opens up a new window. 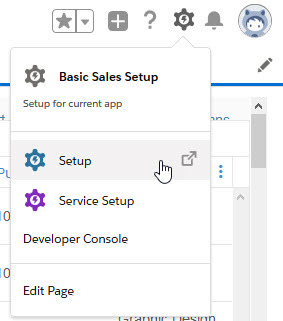 The following is how to create a new custom tab on your Salesforce main page which uses the Popdock widget. A Popdock widget will need to be created prior to following these steps because you will need the widget URL. Click here to learn how to create a Popdock widget. Step 1. Click the setup icon at the top right next to your profile icon, then select "Setup". Step 2. In the left navigation, click on Custom Code so you can choose the Visualforce Pages option. Step 3. Click on New, to create a new Visualforce Page. Step 5. Click the "Save" button and you should see you new Visualforce Page listed. Step 6. Next using the left navigation, click on "User Interface". Then click on "Tabs". Step 7. Here you will want to create a new Visualforce Tab so under the Visualforce Tabs, click on the "New" button. Step 8. Choose your Visualforce Page from the drop down menu, then give your tab a Label, Name, and choose a Tab Style. The rest of the fields are optional. Once you have completed the fields, click the "Next" button. Step 9. The next page in the tab setup is if you want to add to only specific profiles. In this case I have left the default settings and clicked the "Next" button. Step 10. In this step you can choose the custom apps that you want the new tab to be available on. I have again left the default and clicked the "Save" button. Now you will see the new tab added to your Visualforce Tabs and you can go to your Salesforce main page to see the new tab has been added.